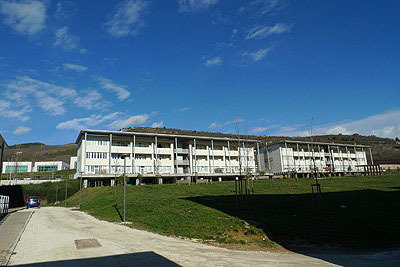 1.1 On 6th April 2009, an earthquake rocked the city of L’Aquila in the Abruzzi. Three hundred eight people were killed and over 2000 wounded. To facilitate rescue operations in the immediate aftermath of the earthquake, any survivors who were financially or logistically (having another place to stay) able to leave the city using their own means were asked to do so. About 35,000 people – nearly half the city’s population – left the area. Those residents unable to leave by their own means were housed in temporary camps set up between 3 to 15 miles outside the city limits. As a security measure - given the impossibility of ascertaining the precise physical damage to each building – and as a prelude to the eventual reconstruction of the city, buildings were systematically reinforced by elaborate “exoskeletons” – either scaffolding or steel beams running from one building to another. These exoskeletons were constructed with such a high degree of complexity and precision and of such expensive materials that their building cost alone absorbed the majority of funds set aside to restore the city. Due to uncertainty surrounding the structural status of each building in the city, a ban on citizens returning to live in their homes the city was imposed. This ban was meant to be temporary yet it is still in effect. Indeed, it very quickly became evident that the “exile” of the inhabitants of L’Aquila would last for a long time as the city reconstruction funds were dilapidated by the construction of exoskeleton scaffolding before any construction could take place. 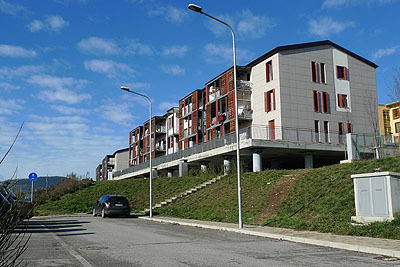 Next, the Berlusconi government proposed to rebuild the city centre on an empty lot near the city center. 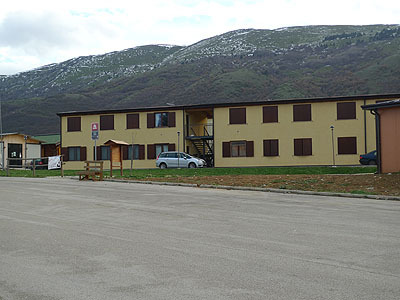 When the L’Aquila city council refused this proposal late in the year, the temporary camps suddenly became a housing crisis as lodgers were faced with the encroaching winter and no plans to rebuild. Large plots of land were hastily acquired for construction. The sole criterion for the acquisition of these plots was immediate availability. The cost of the plots was irrelevant. 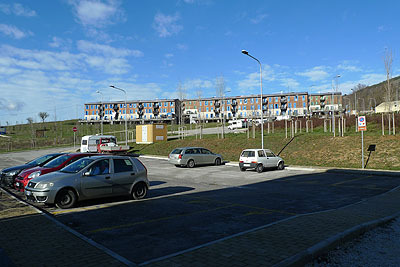 Thus the location of the various construction sites for new neighbourhoods was the result of completely random purchases, with no urban coherence or interconnection of the sites. Once the construction sites had been purchased, a call for tender was issued for the development planning and the deployment of anti-seismic construction systems. However, the decision-making process and the contract award procedures were not entrusted to local or regional authorities but rather to the Italian national central administration. This administrative entity chose to concentrate on a single aspect of the tenders, the anti-seismic construction systems. In the end, they chose the most expensive – but not necessarily the most effective – system. 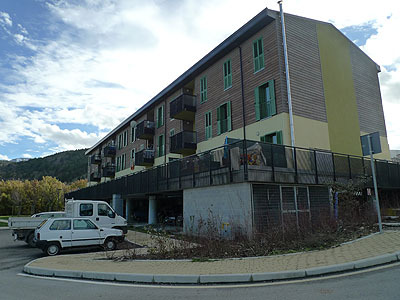 With the decision-making taking place far from L’Aquila and the focalisation on the anti-seismic question, the pragmatic side of building homes was relegated to a low priority. The cost of anti-seismic construction – and of building new housing – absorbed the rest of the money allocated for city reconstruction. 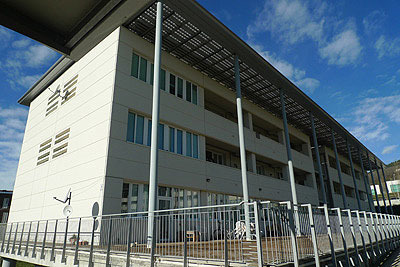 The temporary housing became permanent edifices grounded nonetheless in the provisory. A series of temporary-permanent structures and spaces sprang up around L’Aquila in a network of spatial-temporal interstices. It was apparent that these structures would be around for a long period of time yet they did not encourage settlement and appropriation of vital space. 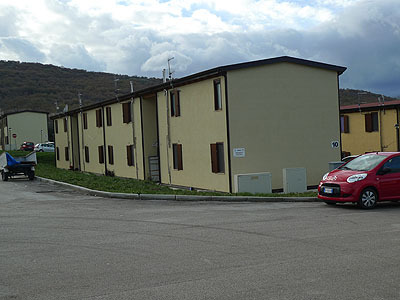 1.2 The incoherence of the decision-making behind the construction of these semi-permanent “dormitories” which have no link to the urban structure of L’Aquila - or to the surrounding countryside - prompted the authorities to attempt to justify their construction. They came up with the acronym of C.A.S.E. 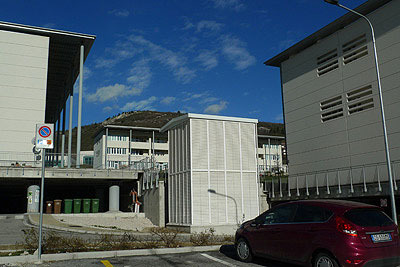 (Costruzioni Anti-Sismiche e Ecocompatibili or Anti-Seismic Eco-friendly Constructions), which echoes the Italian word for houses (case). 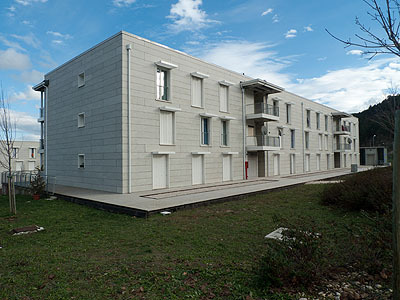 Without ever officially abandoning the idea of “temporary” this acronym attributed stability and an excuse for durability to the new housing projects. By definition, these structures became “superior” to the old buildings of the city center, which in no way could be considered as anti-seismic or eco-friendly constructions within the recently designated architectural standards. 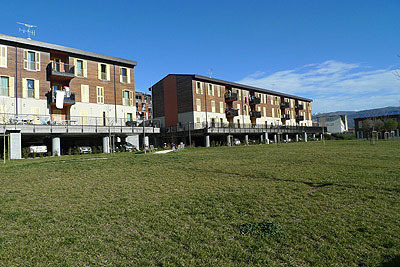 Because the notions of “anti-seismic” and “eco-friendly” did not exist when the buildings were constructed, the authorities imply that they are inferior to the C.A.S.E. 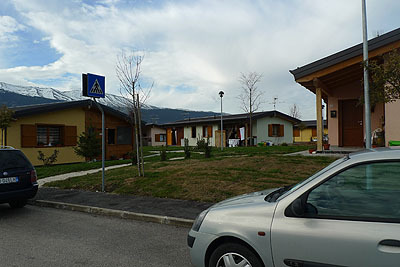 The acronym instilled a positive connotation to permanency: to live permanently in an eco-friendly home was an act of responsibility – and legitimized the permanency of the temporal interstices around L’Aquila. A single figure can be found in all discourse concerning the C.A.S.E. : 30 years. This number is cited each time the rebuilding of L’Aquila and the subsequent duration of the housing projects are discussed. But thirty years also constitutes a generation. With this timeframe any urban planning project becomes null and void. The C.A.S.E. slid out of any timeframe. 2.1 The “Città” is the core of Italian politics and society. The evacuation of L’Aquila meant the destruction of the political space and the social structures of the city. The construction of the C.A.S.E. 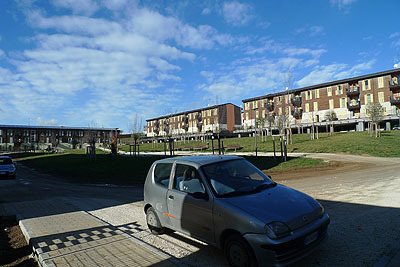 and their random implantation on the outskirts of L’Aquila transformed the annihilation of social structures into a landscaping principle that the inhabitants of L’Aquila cannot escape. 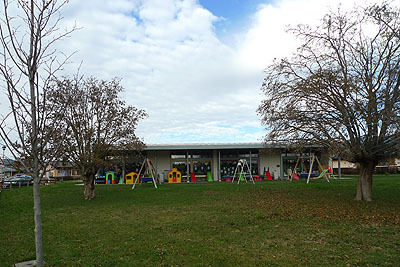 At the same time, within the C.A.S.E., no social structures – stores, restaurants, medical centres, or recreational facilities – have been built. Thus, the annihilation of society, the dissolution of social interaction and the impossibility of developing a social identity in relation to one’s surroundings have become the structuring vectors of the C.A.S.E. The C.A.S.E. are devoid of political and social spaces. Furthermore, no public transportation links the C.A.S.E. sites nor connect these sites with the city. Cars are the sole form of transportation linking the C.A.S.E. to the world outside. Yet, for the most part, the demographic composition of the C.A.S.E population is overwhelmingly elderly people who never drove or who can no longer drive a car. Thus, the residents of the C.A.S.E. rarely leave their lodgings. Despite their high occupancy rate, the C.A.S.E appear uninhabited and social interaction is rarely seen. The C.A.S.E. have not only slid out of the framework of temporal normalcy but they are also beyond the reach of political and social space. 3.1 I discovered the C.A.S.E. 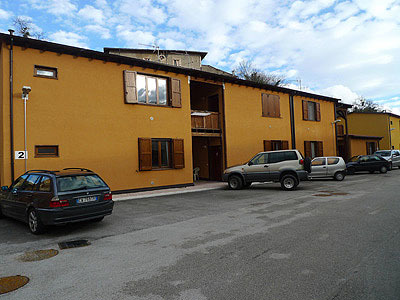 during my second trip to L’Aquila in December 2012. I had already visited L’Aquila but I had only seen the old city. On my second trip, I was travelling with an architect and urban planner, who was specifically interested in documenting the CASE. To pass my time, I took some photos, too. What astonished me during my tour of the C.A.S.E. was the total absence of any visual or aesthetic impact. Despite their physical presence, the C.A.S.E seemed absent. I could of course look at them but I could not really see them nor contemplate them as one might contemplate a form. In the book Beetle in the Anthill by Arkady and Boris Strugatsky (1980), the “wanderers” are a people who can fold-up and disappear in the face of danger. The C.A.S.E. seem to fold upon themselves and disappear in the same manner. 3.2 Later, when I looked at the photos I had taken, I was astonished to see that they looked completely empty. I had the feeling I could see nothing even though they contained ample visual information. The images, like the C.A.S.E. disappeared within themselves as though aspirated into their self-produced void. I was even more surprised that this retraction of the images seemed to spread to the surrounding environment. It, too, seemed to be sucked into the same void. 4.It is very likely that the visual vacuity I witnessed was the direct result of my ambiguous status in relation to the C.A.S.E. I had not initially intended to study them in my initial reflections and my work on L’Aquila. But once I was there and had taken their presence into consideration it was impossible not to photograph them. The strange dissolving of coherence and slowing-down of time produced by the C.A.S.E. proved too fascinating for me to resist the opportunity to photograph them. Yet I had to remind myself that the point of photographing the C.A.S.E was to document the situation and not a question of morbid fascination. I wanted to avoid a voyeuristic approach. The superposition of two incompatible approaches – voyeuristic fascination and documentary-style detachment – may have been what neutralised the images at the moment they were taken. It is likewise possible that the C.A.S.E. do indeed create a visual void, absorbing any regard posed upon them like a black hole absorbing light, allowing nothing to escape. Perhaps the photos of the C.A.S.E. are simply desperately empty non-images. Or perhaps the C.A.S.E images absorb the spectator’s gaze. They are empty because they should not be seen.